The creator of Her Works is making her mark on the handicrafts market in Laos. 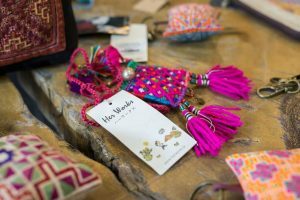 It’s almost a rite of passage for the homebound traveller passing through Southeast Asia– hastily amassing a collection of scarves and cloth bags with ethnic prints to distribute as gifts. 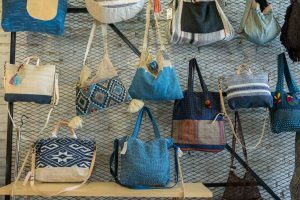 You might even get one for yourself, or have been travelling with the same battered shoulder bag, bought in a street market or handicrafts shop, for months. But it might not look so appealing once you get home – backpacker-style accessories often lose their lustre after a long trip. Where, then, to find something that will last the distance? Something that will still be wearable on the streets of your hometown, or make the perfect gift for a discerning collector? All the better if it comes with an enigmatic label. One like Her Works, for example, that evokes a feminine attention to detail, and a feminist consideration for the majority of makers in Laos. The woman behind Her Works, Douangmany Heuangkhamsene, or Tookta, had all this and more on her mind as she struggled to think of something to fill her recently empty shop in 2016. The Vientiane native had recently closed her restaurant, having spent a fortune on renovating the space on which she had signed a 15-year lease. She had run it as a bar and eaterie for six months with a friend, before realising she couldn’t compete with the established, high-end restaurants in the neighbourhood. Tookta had originally studied jewellery making in Bangkok, with the intention of joining the family business. Her parents own Bountem Gold Jewellery, an established business with a shop and warehouse, that has long been the official maker of the crown for the winners of the Miss Laos and Miss Universe Laos beauty pageants. She found herself wanting to branch out on her own, but when the restaurant failed, she struggled to find someone willing to take over the lease and cover the costs of the expensive renovation. So she began making silver necklaces decorated with the Lao flag, and selling them at her friend’s souvenir shop nearby. These sold well, so she moved onto bags, using traditional fabrics, and sold them under the label Her Works. When her friend moved away, she took another chance, and set up an outdoor shop outside a government bookstore in downtown Vientiane. Within a week, everything in the shop had sold out, and kept selling for months. It was time, then, to set up the restaurant as a shop. That was in October last year, and she has since spent her time roaming the country to source fabrics and textiles from ethnic communities. 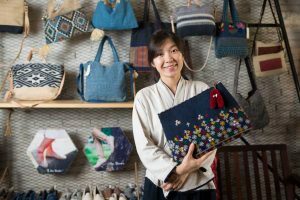 She uses them to make her self-designed bags, clothes and homewares, all with a modern twist that gives them an edge over other, more traditional fare. 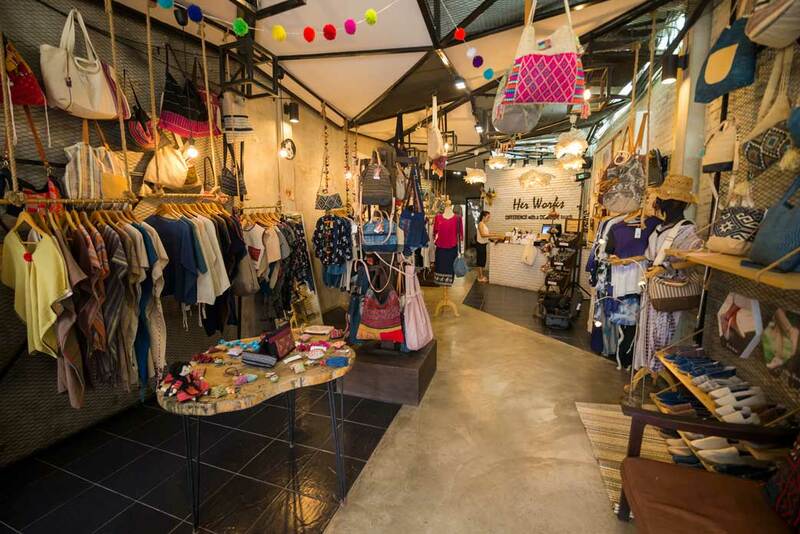 The shop – which still includes the street-side store on Setthathirath Road – is large enough to include some fabrics sourced from Thailand, which has similar tribes, but almost all is from Laos. She’s also spent many hours combing markets for higher-grade zippers and linings, learning more than she ever knew was possible about the sewing trade in her quest to make high-end products that stand apart from the rest. 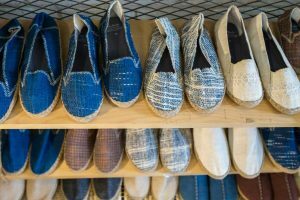 “We’ve had quite a good response, and everyone, when they come to my shop, says it looks very different from other handicrafts shops,” says Tookta. And it’s not just the tourist market she’s trying to attract; many local Lao are interested in different takes on old traditions. 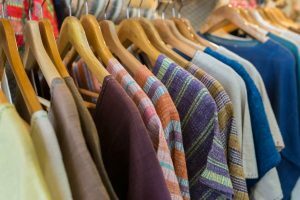 “Many Lao people also don’t know much about minority groups, and in the markets there’s only Lao Loum styles, using Chinese fabrics with embroidery,” she says. She says the shop’s name is there to pay tribute to craftsmanship of so many women working away in remote villages around the country. “I just want to mention to every artisan and every woman involved in making our products,” she says.